The following is a list of upcoming clinics that are scheduled for the 2018 LJYB Season. 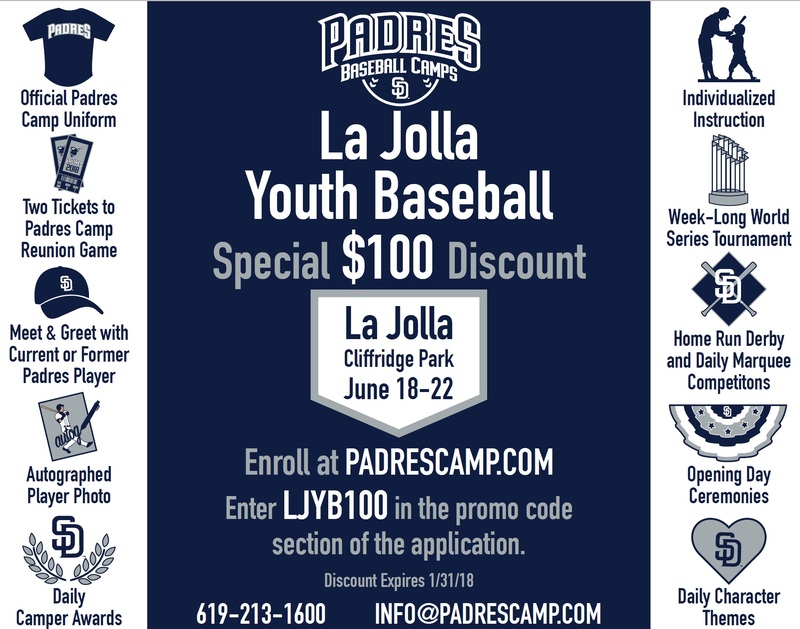 Attention La Jolla Youth Baseball Players!! Fee: These clinics are FREE!! The UCSD Coaches and Players are volunteering their time. THANK YOU TRITONS! What to Bring: All players must bring their own glove, bat, helmet, baseball shoes and lots of water. About the Clinic: The UCSD Tritons are a NCAA Division II baseball team playing in the California Collegiate Athletic Association (CCAA). UCSD has accepted an invitation to play Division 1 baseball in the Big West Conference which includes perennial top 20 teams Long Beach State and Cal State Fullerton. Head Coach Eric Newman is in his seventh season with the Tritons and was named 2017 American Baseball Coaches Association (ABCA)/Diamond NCAA Division II West Region Coach of the Year and CCAA Coach of the Year in 2012. He is now 303-197 for his nine years overall and 208-125 at UCSD! The Tritons finished second in the 2017 NCAA Division II Baseball Championship in 2017! UCSD is 29-18 over nine NCAA Division II Championship appearances, including 15-8 in its fourth trip under head coach Eric Newman. The Tritons are 9-5 at the D-II finals. A number of UCSD Tritons have been drafted by MLB teams including pitcher Kyle Goodbrand who was drafted and signed by the Tampa Bay Rays this year. Outfield Jack Larsen signed this year with the Seattle Mariners. For this exclusive LJYB Pre-Season Clinic, the UCSD Coaches and Players will conduct an age-appropriate clinic with multiple stations for small group activities with a focus on baseball fundamentals and individual instruction. In preparation for LJYB season players will work on the basics of warm-ups, throwing, fielding, base running, hitting and for the more advanced players – pitching and catching. Questions or additional information? Please e-mail . Reggie Smith/Ryan Lehr Pre-Season Hitting Clinic in La Jolla February 3rd and 4th! Get Your Swing Tuned Up for the 2018 Season! 17-year Major League veteran, Reggie Smith (Boston Red Sox, St Louis Cardinals, San Francisco Giants and as a World Series Champion with the Los Angeles Dodgers) will be at our La Jolla Pony field to teach your kids the same process of natural hitting mechanics - vision, grip size, stance width, spine-angle, stride-length and swing mechanics - that he teaches current major league players. This is a great opportunity for your players to get ready for the upcoming baseball season which starts the first week of February. Ryan Lehr was drafted in the 8th Round by the Atlanta Braves in 1997. He spent 12 years in Professional baseball as a third baseman, first baseman and outfielder for the Braves, Angels, Astros, Orioles and Royals organizations. He retired in 2008 with a .288 career average and 84 Minor League homeruns. In 2009 he began working as an understudy to Smith and has been successfully coaching kids in San Diego and Southern California since then. The clinic is Saturday, February 3rd and Sunday, February 4th from 9:30 AM to 12:45 PM at our LJYB Pony field on Cliffridge Ave. To ensure each student gets necessary attention to detail the number of attendees are limited for each clinic, so be sure to register ASAP. To REGISTER for the 2 day Reggie Smith and Ryan Lehr clinic click HERE. For more information and to register for a one day clinic click HERE. During each clinic, players will be divided into small groups to have their mechanics, plate set-up, swing plane and bat-speed analyzed. Specific recommendations and solutions will be offered that are tailored to each individual to enhance the players development of optimal balance and mechanics. The following is a list of clinics that have been completed. Thank you to the great coaches and players for providing your time and expert knowledge for our league!